NASHVILLE, Tenn. (May 25, 2016) – In 1986, Coca-Cola used the marketing slogan “Red, White and You,” to promote their signature red and white Coca-Cola classic cans; and now, in 2016, they’re going all out red, white and blue. 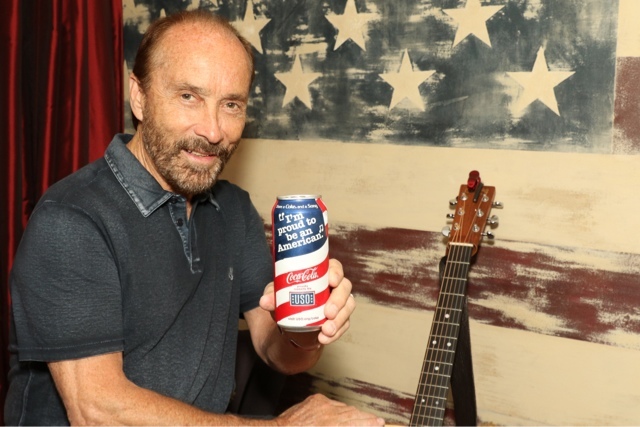 America’s patriot and country music megastar Lee Greenwood has partnered with the drink giant to lead its multi-platform “Share a Coke and a Song” campaign into Memorial Day with his iconic lyric, “I’m Proud To Be An American,” gracing the packaging of limited edition cans and bottles nationwide. "Coca-Cola is an all-American brand, so aligning 'God Bless The U.S.A.,' with them this Memorial Day and beyond is one of the many defining moments in my career where I realize the profound impact this song has had. I'm truly proud to be an American," said Greenwood. Find the exclusive, star-spangled bottles and cans in gas stations, grocers, convenience stores and vending machines across the country from ‘Detroit down to Houston and New York to LA.’ Fans who post a picture onFacebook, Twitter or Instagramusing the hashtag #ShareACokeAndLeeGreenwood tagging @TheLeeGreenwoodwill be entered for a chance to win tickets to an upcoming Lee Greenwood concert and get an exclusive backstage meet-and-greet. On Sunday, May 29, Greenwood will also perform a special military tribute honoring over 600 U.S. Army soldiers, Medal of Honor recipients and veterans at the NASCAR Sprint Cup Series Coca-Cola 600, as part of its “Salute The Troops” pre-race show. Sunday’s 57th running of the race is hailed as one of the biggest military appreciation pre-race spectaculars in the track’s history.